A 5kW solar power system is a size that should easily offset a typical Australian home's electricity usage. If it doesn't, then you've got one serious energy guzzler of a home and should really consider an energy audit before going solar! 5kW solar systems are also the minimum system size you should be considering if you're looking to add batteries to your system in the future. Here's what you need to know about 5kW systems, including price information. How many solar panels will you need? 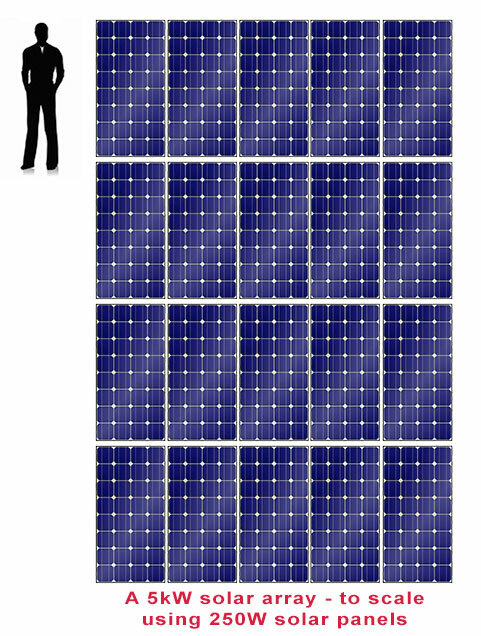 To make up a 5kW solar system, you need 20 solar panels, assuming you use 250W panels. Each panel will be about 1.6m x 1m, so you'll need at least 32m² of roof space. How much electricity will a 5kW solar system generate? A 5kW solar system will generate approximately 20kWh per day, depending on your location and a variety of other factors. The average home in Australia uses about 16kWh per day. Note that this does not mean installing a 5kW solar power system will automatically give you a $0 electricity bill, as most households use the majority of their electricity at night when the sun isn't shining – I talk about this in greater detail here. How much money will a 5kW solar system save? You may be thinking: "If the 5kW system offsets my energy usage, then surely it's going to wipe out my electricity bill?" Unfortunately it is not that simple! The amount the electricity companies will pay you for your solar energy is, in most states, way lower than the price they charge you to buy the same electricity from the grid! Plus, there's other costs on a bill such as supply charges, aka service charges. However, a 5kW solar power system is still an excellent investment. 1) Use all the solar electricity in your home. This is unlikely unless you have a mini aluminium smelter in your back garden – or you operate a small business from your home. If that were your situation, you would save approximately $2100 in the first year, and around $67,000 over 20 years; taking electricity inflation of 5% into account. Those are some serious savings. 2) Export half the electricity: You would save about $1400 in the first year. 3) Export all the electricity: You would save about $700 in the first year with a 5kW system. If you think that this sounds very counterintuitive, then you can read about the relationship between exports and payback here. You can see the numbers for yourself and change all the assumptions to see how they affect payback with my solar payback calculators. How much will a 5kW solar power system cost? The cost of a 5kW solar system will be around $10,000 before STCs, then you should get about $3,500 subsidy from STCs (aka the solar rebate). Taking into account the subsidy, expect to pay about $6,500 out of pocket costs for a 5kW system. How long before a 5kW solar power system pays for itself? If you are not exporting the energy and assuming you've paid a reasonable price for a 5kW solar system, then you should see a payback period of less than 5 years – so a fairly rapid payback timeframe. But you can actually be cash flow positive from day one if you get cheap solar finance. It is very easy to finance the purchase so that your monthly energy savings are worth more that the cost of paying back the loan. Again, my solar calculators show you with simple red or green bars whether the investment is cash flow positive or negative; i.e. if it is cost-effective. It can be a laborious process to find a trustworthy solar installer to provide you with a good-quality 5kW solar power system at a reasonable price. This is why I've done the hard work for you, and curated a list PV installers that I trust to do the job properly. If you want 3 competitive quotes for pricing on a 5kW solar system, from local specialists (including payback calculations), you can get them here.